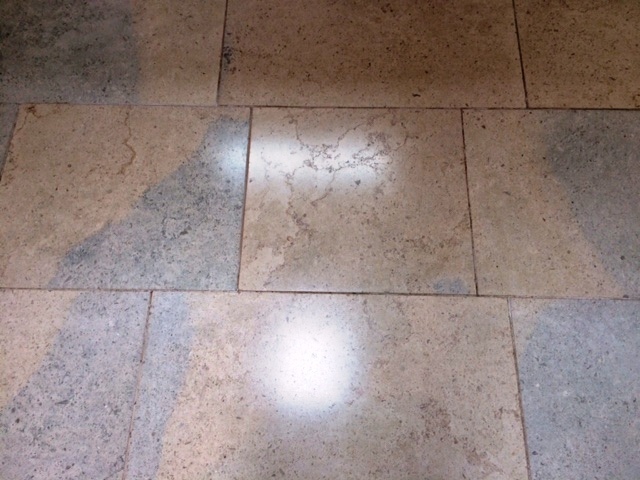 It’s not too common that you find two very different natural stone tiled floors in the same property. However, this is exactly what I discovered on a recent visit to a farmhouse property in Ripley, near Harrogate in North Yorkshire. The owner wanted to restore both their Westmorland Green Slate tiled entranceway and a Blue Moleanos Limestone tiled floor. 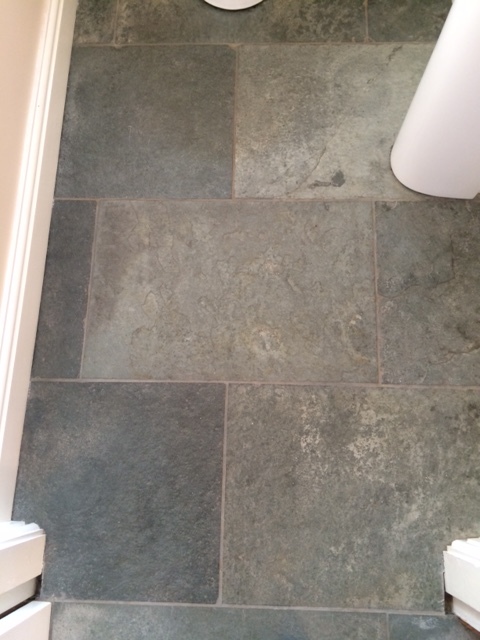 Westmorland Green Slate originates from the Lake District in Cumbria – where it has been quarried for many centuries – and is known to be a high quality and popular choice for flooring due to its subtle and pleasant green shades. By contrast, Moleanos Limestone originates from Portugal and is one of more commonly found types of Limestone used in buildings across the world. But while the two floors were very different, the customer’s objective was the same for both – to restore the appearance of the tiles and return the shine to the stone. Here’s how I did it. The first floor I tackled was the Westmorland Green Slate, situated at the entrance to the property. Naturally, given that the tiles are situated in a high traffic area, they were very dirty and required a deep clean. 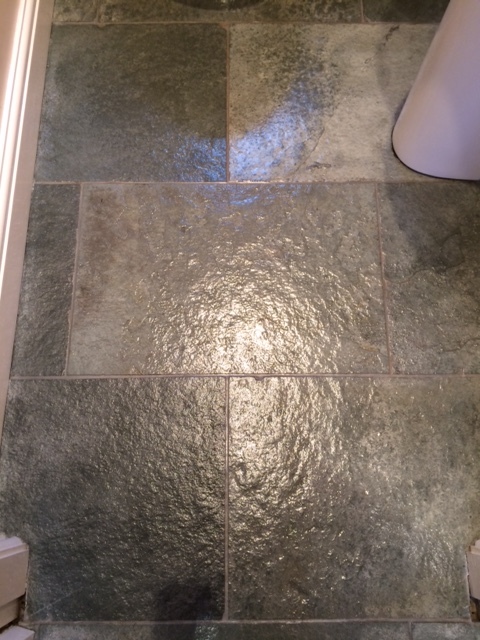 To do this, I applied a strong dilution of Tile Doctor Pro-Clean, which is our high alkaline, multi-purpose cleaner, stripper, and degreaser. The product was scrubbed into the tiles using a scrubbing pad fitted to a heavy-weight rotary machine to strip away any old sealer and remove the ingrained dirt. One I was satisfied with the condition of the floor it was rinsed with water and a wet vacuum used to remove the now soiled cleaning solution. Once the floor had been left to dry completely, I was able to give the floor a fresh seal in the form of four coats of Tile Doctor Seal and Go. This sealer is specially formulated to provide both a stain resistant surface seal and a durable low-sheen finish. Whilst waiting for the slate floor to dry I moved on to restore the Blue Moleanos Limestone tiles, which covered a floor area of 20 square metres, but were looking very sad, tired, and lifeless. To clean polished Limestone tiles, we typically use a process known as burnishing, which involves the direct application of four different diamond encrusted burnishing pads to grind away old sealers, dirt and stains, before polishing the stone to restore lustre. First, I used a Coarse 400 grit burnishing pad to strip the floor of the old sealer and remove all grease marks and stains. I had to go over the floor with the pad twice to get rid of some particularly stubborn grease spots. Having done that, I moved on to focus on building back up the polished appearance of the Limestone by applying the Medium 800 grit, Fine 1500 grit, and Very Fine 3000 grit burnishing pads, with a light spray of water to act as a lubricant with each. This achieved a high-quality satin finish, which I ensured will be protected for the long-term by sealing the stone with Tile Doctor Colour Grow – an impregnating and colour enhancing sealant. It took me three full days of work to clean, polish and seal both floors – and the hard work paid off, as the customer was absolutely delighted with their rejuvenated tiles! 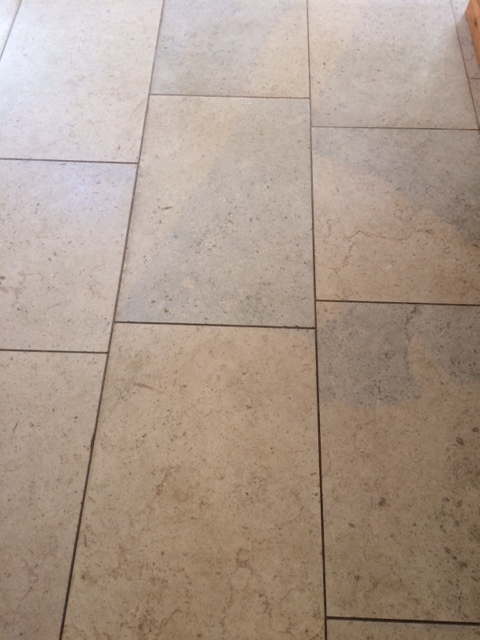 Nigel has cleaned restored and sealed a large kitchen floor area in Indian stone which had been a bit neglected and on another occasion also repaired and sealed a fully tiled in travertine wet room which I had damaged by inappropriately using a strong de scaling solution. It looks better than before. He is reliable,hardworking and highly skilled and consequently his work is exemplary. Nigel carried out the work and explained exactly what he would be doing. There was no mess and the results were excellent a very even and polished result. I would recommend anyone considering having there tiled floor polished to use Tile Doctor. Well done. Quick communication and date given for completing work. Nigel did an excellent job; very clean, professional a great result on the shower which now looks good as new. I was impressed by the speed of The Tile Doctor in response to my online enquiry. I received an e mail the same day informing me that Nigel would contact me. Nigel contacted me, again the same day and arranged to visit to look at the fireplace. The fireplace needed a good clean and Nigel explained fully what it would involve and how long it would take. He was honest with us that some of the stains he may not be able to remove fully but that he would try his best.He is very professional and puts you at ease very quickly. I was really happy with the work he did and he has given our tired looking fireplace a new lease of life and the marks he believed he may not be able to remove have faded almost into insignificance. Would highly recommend the work of Nigel, thank you for doing a great job.